I was recently thinking how the fashion industry is not really as inventive as the music industry. Sure there are regular new trends lasting approximately a decade in both, but fashion seems to be much more influenced by the past (sometimes even the recent past!) than music. Sometimes you’ll hear musical influences of other artists in music, but rarely do you hear ‘new’ music that harkens back to a previous era. Fashion is much more cyclical. Having said that, fashion has been sliding along the comfort continuum for some time now; corsets moved to girdles and brassieres, and then to bras alone and now to sports bras without wires. Ok, sure, the shapewear market is alive and well, but no one would think to wear it on a daily basis. And frankly, I’m glad that I can support my girls without whalebone! But this comfort shift has brought an accompanying casualization of style. No woman in the 1940’s, no make that even the 1960’s, would ever been seen out of her house without a hat and gloves, and certainly never in her pajamas. And yet I regularly see people in my neighborhood popping to the shop in their pajamas. But not nearly as often as I see athletic wear, or ‘athleisure wear’, for all occasions. From left to right: Marine Serre dress in Vogue Jan 2018, Nordstrom window Feb 2017, No Ka 'Oi in Vogue Jan 2017, Versace dress in Vogue May 2017. But what's more interesting to me as a fashion observer is how this trend has become ‘stylish’. Rihanna has an entire line for Puma done in collaboration with Fenty, the Italian fashion house famous for it’s fur. The Puma website describes the collection this way: "Beachy and badass, it’s a vibrant, unexpected mashup of high fashion, extreme sport and beachwear." All images Fenty Puma by Rihanna. Kendall Jenner too. In her role as a brand ambassador for Adidias she puts her own spin on the athletic clothing and takes it into a league that is definitely not athletic wear. Note the tights with white heels and what can only be described as a tracksuit. But it’s not for everyone. While I’m in favor of clothes that are comfortable and practical, my personal style veers more towards ‘elegant’ than ‘street’. And athleisure is both more ‘street’ and more casual than I like for myself. But I have a funny feeling that I am going to find myself on the wrong side of history on this one – my ten year old daughter refuses to even wear jeans, stating that they’re ‘uncomfortable’. Should anyone be surprised that the athleisure wear trend has filtered down to the teen and tween market? What will be interesting is how this ‘trend’ shakes out as the new normal. Remember, there was a time when older folks didn’t wear denim, and it wasn’t all that long ago. Perhaps I’ll be spending my twilight years in athleisure wear, because let’s face it, comfort is pretty key when your mobility is compromised! I don’t know about you, but I am ready for it to be spring. There are some brave blossoms out there, we’ve had lots of blue, blue skies and Easter is just around the corner, but the weather is not exactly cooperating. Snow on the first day of spring? Sigh. My soul is positively yearning to don pretty spring clothes, but it’s not just chilly, it’s downright cold. And yet, the brighter light and longer days make the deep colors of winter just feel wrong. What’s a girl to do? How can you embrace the calendar, and yet still dress for the weather? Of course, before too long those of us south of the Mason Dixon line will be having the opposite problem – it will be too warm for the clothing that the calendar might suggest is appropriate. An equally vexing problem! Not to worry. I may have spent far too long thinking about this problem so that you don’t have to. Here are my suggestions for how to handle this transitional season conundrum. Please note for those of my readers north of the 49nd parallel (did you see how I’ve incorporated some geography lessons here too?) some of these suggestions may require further calendar advancement before the application will be appropriate. I’ll assume you all have good, sensible judgement. The problem for most of us is how to transition our winter clothing into spring without a) feeling uncomfortably chilly and b) looking like we’ve just returned from a tropical vacation and didn’t have time to change. I suggest that you stay with the neutral basics you have likely been wearing through the winter, switching out the sweater under the jacket for a pretty blouse in a spring color, or changing the jacket for one in a decidedly spring hue. Or, just wear a sweater in a pretty spring color. Millennial pink is still big this spring, although the runways also showed lavender and a deeper hued pink. Personally I wish I could pull off the pretty peach color I saw in the stores – it’s something new we haven’t seen in a while and is just so, oh I don’t know, hopeful. There’s no need to lighten up from head to toe, pick one piece and consciously make it over into spring. For example, your black or navy bottoms can easily become more spring-like with a lighter colored sweater or jacket. Or add some broderie anglaise or eyelet (big this spring!) under your regular jacket and you’ll still be comfortable, but spring-like. You could also continue wearing a winter weight sweater or jacket with a lighter hued or weight skirt or pant. I had some fun finding pieces like these that will all layer well with warmer, more wintery items, but still give you a nod to the season AND transition nicely into summer. Alternatively, you can choose a 'feels like spring' dress (without becoming a garden party all by yourself) and either wear a layer under it or top it with a sweater or jacket and keep your tights and boots on for now. The blue shift dress, above, is ideal for this transition. The key is to add in a spring element somewhere. I don’t think florals will ever NOT be a spring thing. Because fashion reflects nature, after all. Having said that, extreme floral prints really do belong in summer weddings, garden parties, and your aged aunt's closet. If you feel yourself drawn towards florals, incorporate them in a blouse or scarf, or perhaps in a skirt or dress if they aren’t too over the top. Depending on how chilly it is, you might be able to wear your fashionable ankle pants without socks, either with boots, or maybe even with a more open, transitional shoe. Personally, until it is actually warm enough to bare my legs (and they’ve had some weekend opportunities to be sun-kissed), I’ll still be wearing tights or ankle pants. Note: these are not sandals. It really, truly needs to be spring to successfully pull those off! I'd consider these options all transitional as they can be worn with socks or tights as well as without. The easiest way to add spring! Try a pretty patterned scarf, shoes in a lighter color, or a pastel handbag. If you really aren't wanting to invest heavily in spring, this is where a little careful shopping will sweep you into the season without breaking the bank. Aren't these fun for the weekend? Yes, it may be chilly outside, but when it’s nearly April, I think it’s ok to carry a pink handbag. Or this one! Doesn’t it just make you feel lighter and happier? I saw a woman just this week who was managing to do just about all of these things in one outfit. It was a coolish day,and she was wearing pale blue, cropped cotton trousers trimmed with eyelet, a jersey shirt tucked into these pants and finished with a black belt, a cropped black leather jacket and a multi-hued plaid wool scarf draped over the top. I can’t quite remember the shoes, but I think some sort of ankle boot with no socks. Granted, this is not something I could pull off, but she looked fashionable, seasonably appropriate and comfortable. So go, have some fun shopping your closet for what you already have, and add in a few pieces that will take you from this spring that isn’t a spring into the summer. We saw this amazing seamless, sequined cape worn by the designer herself! See video below. My dear friend and I regularly find cultural events to attend; sometimes something artistic, sometimes something gastronomic. This past weekend we got a bit of both - a fashion show, with bubbly! and a whole new kind of people watching. But that's not what this is about. This is about the fashions we saw: beautiful, forest nymph-like dresses fashioned from wool felt. It was the spring collection, but it got me to thinking about wool felt as a fiber choice. Now you know I'm always looking for ways to stay warm. What I didn't know is that felted wool is much warmer than woven wool (nowhere for air to sneak in), and with a much greater warmth to weight ratio. It's incredibly time consuming to make (Elynn at Amano Studios has some great videos illustrating the process), and tends to be strictly hand crafted as a result. Which can be both good and bad. 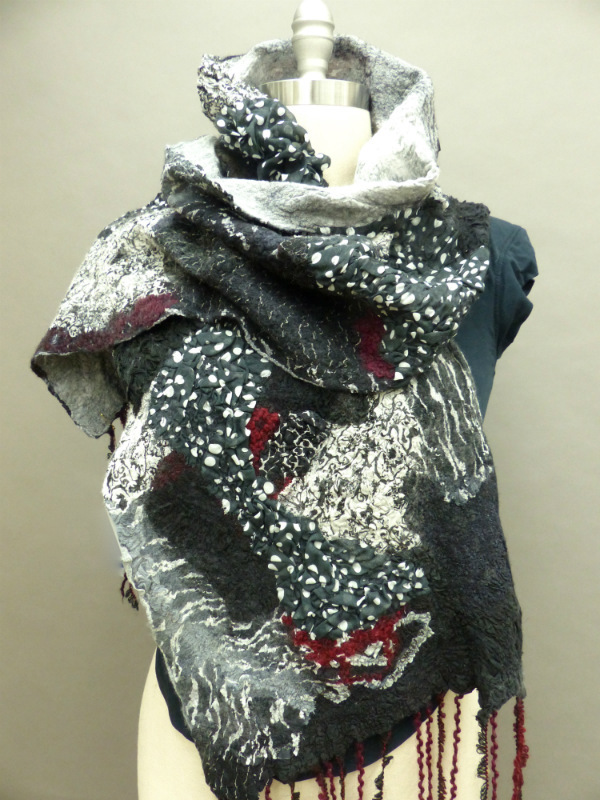 Good because you end up with beautiful, one of a kind garments that can be truly show stopping. Bad because that could you mean you take your appreciation of the art form a little too far into the fringe. I think you know what I mean! So I set out to see what I could find that could be suitable to wear for statement making office dressing. I had to get past all the slippers, hats, and other extremely arty things that are typically made from wool felt, but I did indeed find some wonderful felted items. The brown sleeveless top and the red 'sweater' could work in just about any office setting and are certainly more defining than something from Ann Taylor. Interestingly enough, many of these felted items are made by craftspeople in Russia - they just might know a thing or two about handling cold weather! The white sculptural top is a little more casual, but the detail alone is interesting enough to pass muster in most environments. I think they all have tremendous versatility as well as maximum seasonable wearability on their own or with some carefully chosen layers. Some more office worthy jackets that are decidedly statement making. 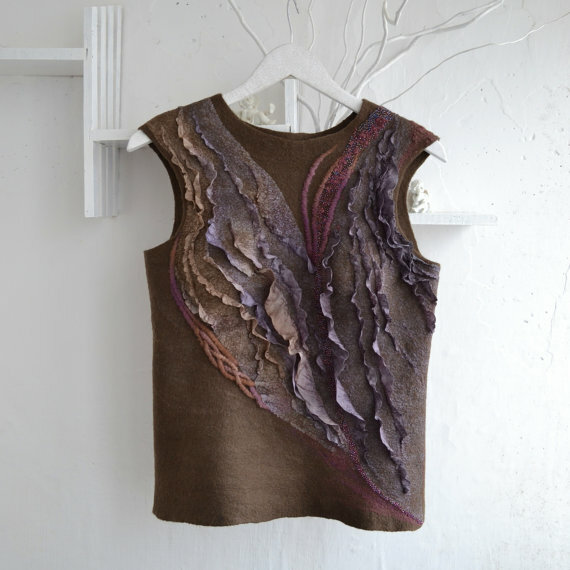 Felt is so interesting because it is often shaped into garments without any seams, or combined with other fibers to make beautiful embellishments. The blue oversize jacket in the middle I can see both as a dressed up or a dressed down piece, either layered or not. All by Elynn at Amano Studios. Now for something really show stopping and ultra feminine, you could do much worse than these beautiful felted dresses. I'm fairly certain you would turn heads for all the right reasons wearing one of these! Left, emerald green silk with felted flowers. Right, all wool felt. As I mentioned at the beginning of this post, many of the wonderful pieces we saw at the fashion show were sylph-like and made me think of goddesses in the woods. Not necessarily what you want on a day to day basis. 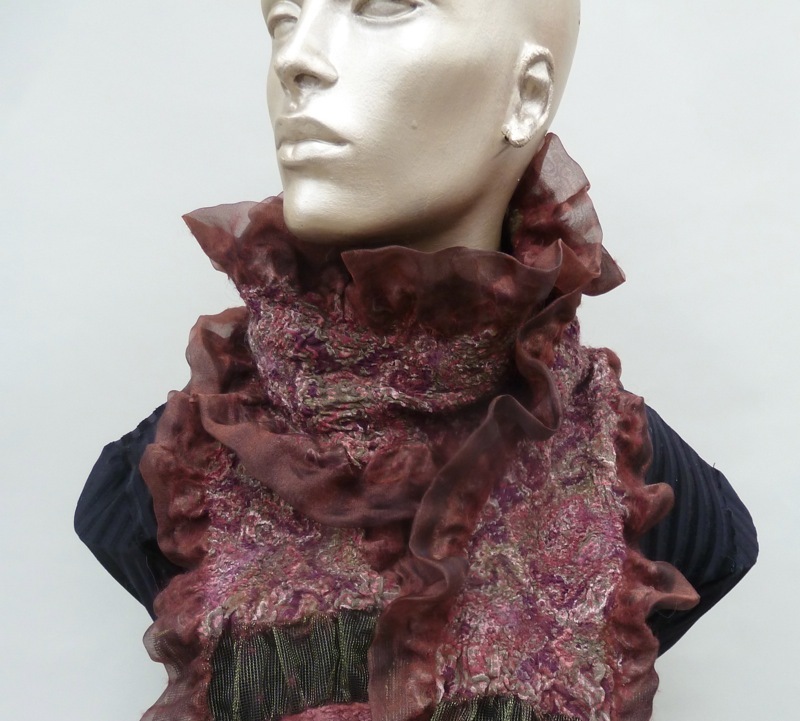 But for a special occasion, Irena Levkovich of Wool Wonders has some absolutely fantastic pieces, like this collar. I don't know where or how I would wear it, just that I desperately want to! We enjoyed Irena's Wool Wonders fashion show and I even had a chance to talk with Irena herself. 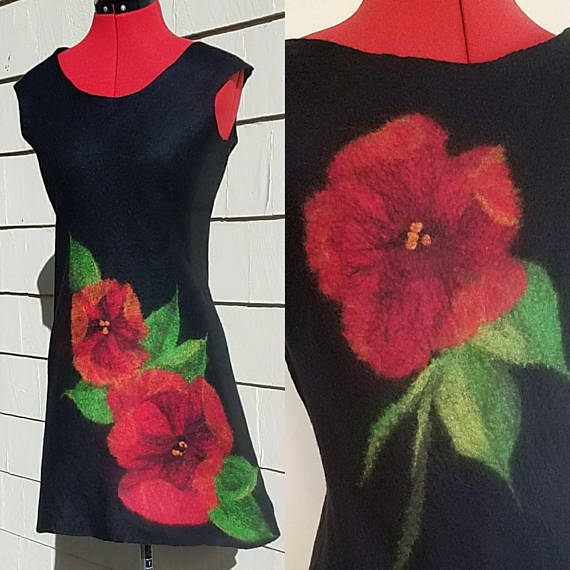 She features tutorials online and runs felt classes in Northern Virginia - maybe something my friend and I will find ourselves signing up for in 2018.